You can now help revive the Saturn V.
The U.S. Space & Rocket Center in Huntsville, Alabama has launched a public effort to return its one-of-a-kind standing replica of the Saturn V moon rocket to its like-new condition in time for the 50th anniversary of the Apollo 11 lunar landing this summer. The real Saturn V, which was developed at NASA's Marshall Space Flight Center in Huntsville, launched the mission that landed Neil Armstrong and Buzz Aldrin on the moon in July 1969. "This Huntsville-made rocket launched Apollo 11, achieving the seemingly impossible and putting man on the moon. It inspired an entire generation to look toward the stars and imagine," said Deborah Barnhart, chief executive officer of the U.S. Space & Rocket Center, in a video statement. "Now with the 50th anniversary of the Apollo 11 moon landing fast approaching, we are asking for your help to ensure the Saturn V replica is as vibrant as the dream that inspired it," added Homer Hickam, the chairman of the U.S. Space & Rocket Center's governing commission and author of the 1998 memoir, "Rocket Boys." 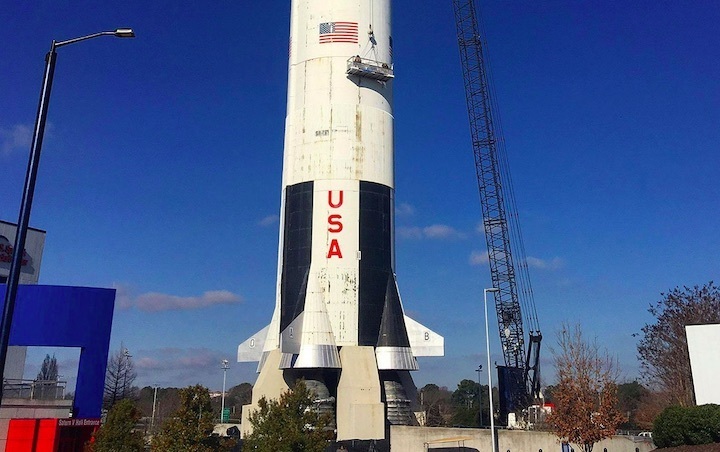 The 10-week "Revive the Saturn V" campaign seeks to raise $1.3 million to clean, reseal and paint the 363-foot-tall (110 meter) rocket replica that has stood at the U.S. Space & Rocket Center since 1999. Erected for the first moon landing's 30th anniversary, the Saturn V replica has been exposed to 20 years of weathering and outdoor conditions, leaving it with peeling and missing paint, dirt and damage. The campaign is also underwriting preventive maintenance to protect the Saturn V replica for the decades to come. "You can help with a donation to help us preserve the legacy and the achievement that this rocket symbolizes. Any amount is appreciated and will go toward this $1.3 million project," said Barnhart. NASA launched 13 Saturn V rockets between 1967 and 1973, including nine that flew astronauts to the moon and one that deployed the United States' first space station, Skylab. Half a century later, the Saturn V remains the tallest, heaviest and most powerful rocket ever successfully launched. Three Saturn V rockets survive today as artifacts, including one displayed inside the Davidson Center for Space Exploration at the U.S. Space & Rocket Center. The historic hardware though, is all exhibited horizontally, on its side. The replica is the only vertical display of the Saturn V in the world. "Over the years, the Saturn V rocket has remained a symbol of human ingenuity," said Hickam. "The U.S. Space & Rocket Center's Saturn V replica stands as a symbol of what can be done when people set aside their differences to prove the impossible is possible." 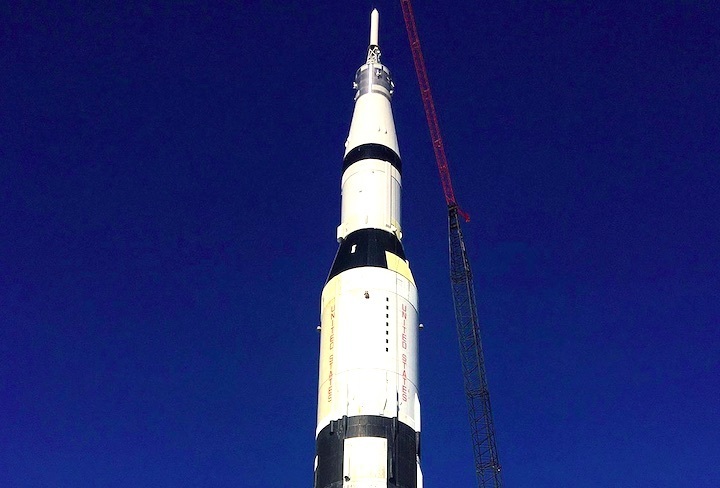 As part of the campaign, the rocket center will also be inviting the public to share their photos and stories about the Saturn V replica and even help out by applying the final touches to the project. A subset of the fundraising effort, dubbed "A Brush with Greatness," will provide donors who give $1,000 the opportunity to help paint the lower section of the Saturn V replica when the work reaches that point in the spring. A 300-ton crane, provided by Birmingham Steel Erectors and cleared by the Federal Aviation Administration (FAA), will support the skilled contractors who will prime and paint the upper sections of the sky-scraping rocket. 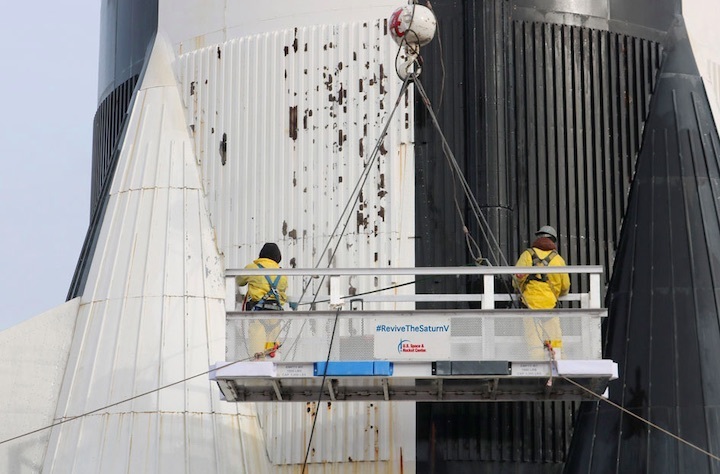 Workers have already scaled the Saturn V to begin power washing its black and white surface. The U.S. Space & Rocket Center, which serves as the official visitor center for the Marshall Space Flight Center and is home to U.S. Space Camp, receives no funding from NASA or the federal government. While the center is a commission of Alabama, its state funding only covers three percent of its expenses. For projects like the Revive the Saturn V campaign, the center relies on donations. The U.S. Space & Rocket Center, along with the City of Huntsville, is planning an Apollo 11 50th anniversary celebration that will include a Guinness World Records attempt at the most simultaneous rocket launches and an Apollo homecoming dinner. The replica Saturn V will stand at the center of these activities, hence the desire to have it looking its best. The Revive the Saturn V campaign also falls under the center's on-going Rocket Protector campaign, which is repairing and restoring the other historic missiles and launch vehicles that are displayed near the Saturn V replica in the center's rocket and shuttle parks. "Become a part of history and help inspire future generations as mankind dreams once more to go back to the moon and on to Mars," said Barnhart.